UPDATE: Congratulations to Jon Suk and Jamie McCue – they each won a pair of lift passes to enjoy a day of spring skiing or snowboarding at Mount Washington! Thanks to all who entered. Spring is officially in session on the slopes! With a mid-mountain base of nearly 700 centimetres, the lifts at Mount Washington Alpine Resort show no sign of stopping anytime soon. The skiing and riding conditions are at the peak of perfection and with that comes an event-packed April. Spring skiing kicks off tomorrow night (April 1st) with a free nighttime pass in exchange for a non-perishable food donation. This weekend will be dominated by the Full Throttle Slopestyle Competition [details], the Thrifty Foods Dummy Downhill contest [details] next weekend and the crowd-pleasing Barq’s Slush Cup on April 10th [details]. While Sunday, April 10th is the last official day of the full 2010/2011 season, the mountain will be open from April 15 – 17 and for the Easter long weekend from April 22-25. However, something tells me there may be even more weekends, but don’t take my word for it – stay tuned to the mountain’s lift reports. I’ll draw one winner at noon on Friday, April 1st and another winner at noon on Monday, April 4th. Good luck! UPDATE: The winner of the first pair is Jon Suk (@jonsuk on Twitter)! Congratulations! Stay tuned and enter to win the second pair of lift passes on Monday! 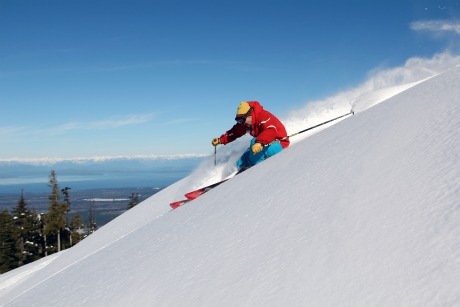 Mount Washington Alpine Resort is located on the Strathcona Parkway in the Comox Valley. For more information, visit the resort online or call direct at 250-338-1386 or toll free 1-888-231-1499. You can find Mount Washington Alpine Resort on Facebook or follow their active updates on Twitter. I want to ollie a marmot! Would be awesome to get in more than one day this year! I would love to get up there at least once this year! Keeping my fingers crossed, would love to get back up for another good run! Best times ever up there!!! Been up almost every weekend this season… Would love to enjoy it compliments of! Thanks for a great season Mother Nature and Staff! I’ve never been to Mount Washington – would love to check it out! Would be an awesome April to go up one more time! Pick me, Pick me!! Would love to go up to Mt. Washington again! never been to Mount Washington…..I already have a place to stay and it would be a great addition to a trip to the island!!! One more day of glorious Mt. Washington would be fabulous!